A dinosaur named Herb has noticed something about his friend Muriel: she's getting taller. Herb is not. Desperate to catch up to Muriel, Herb tries every method he can think of to grow. He plants himself in the dirt like a flower, but that just leaves him muddy. He has Muriel roll him out like clay, but that just makes him dizzy. He wears platform shoes and a top hat, but he just falls over. Nothing Herb tries works! When will he finally grow? 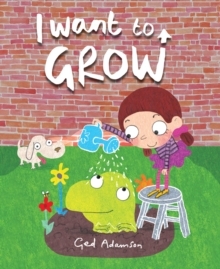 This humorous approach to the topic of growing taller will resonate with many children who struggle with this same issue.